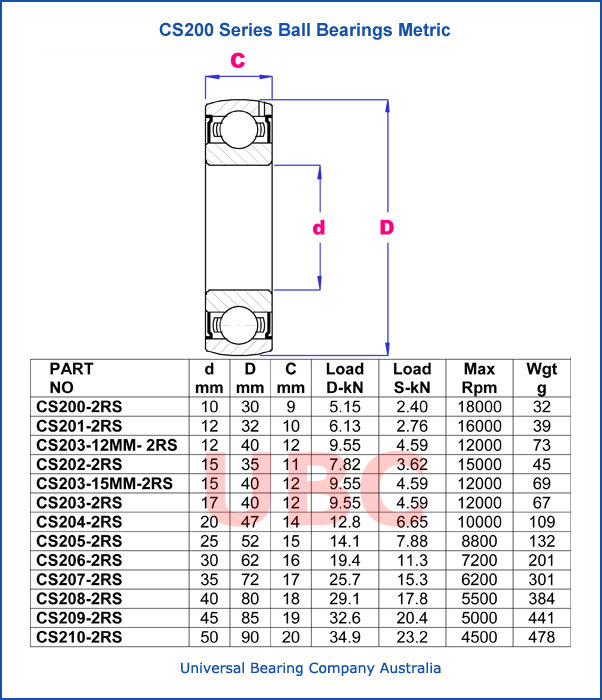 CS200 deep groove single row ball bearings series are non-separable and require little attention or maintenance in service capable of operating at high speeds and are widely used radial bearings. The inner and outer ring of single row deep groove ball bearings have a deep groove raceway the bearings are mainly used to carry radial loads and a part of axial loads in two directions. This kind of bearing can carry much heavy axial loads after the increase of radial clearance thus it can take the place of high speed angular contact ball bearings. Types: 6000 6200 6300 6800 6900 series Corresponding types: 603 - 609 6000-6010 623-629 6200-6210 683-689 6800-6810 693-699 6900-6908 6300-6308 Material Used: Shield-closure: Open bearing Z ZZ RS 2RS Vibration and noise level: Z1 Z2 Z3 Z4 Precision level: P0 P6 P5 (ABEC1 ABEC3 ABEC-5 ABEC7) Fields Used In: Motor Automobile Precision Machinery Electric Tools Power Tools Sports Apparatus office equipment Agricultural Machines etc.